"The concept is meant to appeal to heart and mind. I want contemporary art to create a dynamic, giving the people living around the sculpture a chance to take part in it. What I loathe, is passive stone sculptures the developer crams in at the end." Today Pulse works as a symbol and leading star for a sculpture complex in motion. Modahl wanted to achieve a symbiosis of contemporary art and modern habitation where the core idea was to communicate with the inhabitants. Displayed as a key land art site in "Destination Art", a land art/site-specific art reference work. This book is the first ever comprehensive critical guide to land and environmental works, sculpture parks and site-specific installations worldwide. 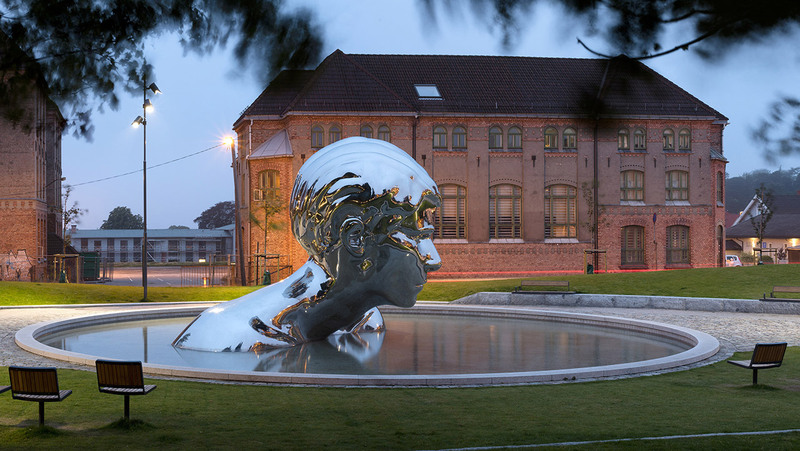 A giant youth emerging from a pool of water on St. Marie plass, is a site-specific celebratory landmark in Sarpsborg, Norway. It reaches back in time to reference the city´s founding father while acknowledging the continual evolution and redefinition that cities and nations must undergo as they face the future. The specificity of Finn Eirik Modahl´s Genesis combined with its universal aspects and commanding presence will provide it with a lasting appeal. The copper sculpture is inspired by Rene Descartes ideas of the pineal gland. He regarded it as the principal seat of the soul and the place in which all our thoughts are formed. The head chakra here is in the shape of a pinecone, pinus sylvestris. It is placed on Sotra right outside Bergen, Norway. Sotra can trace its name back over 3000 years. The Norwegian sculptor Finn Eirik Modahl has created a new major Norwegian National Monument,- a giant obelisk of glass and stone, overlooking magnificent fjords and mountains. The monument "Elektra" is located in Tyssedal in Norway. "The giant megalith of Granite and glass is fantastic", the Sculpture Magazine writes in a report. The stone part is taken out 18 meters inside the mountain. And it's cracked into form. Not cut. The glass part is made of 999 handcut 6 mm glass plates. With neon inside, it glows in the night with a green light. Like the color of a mountain lake. It was unveiled in 2000. 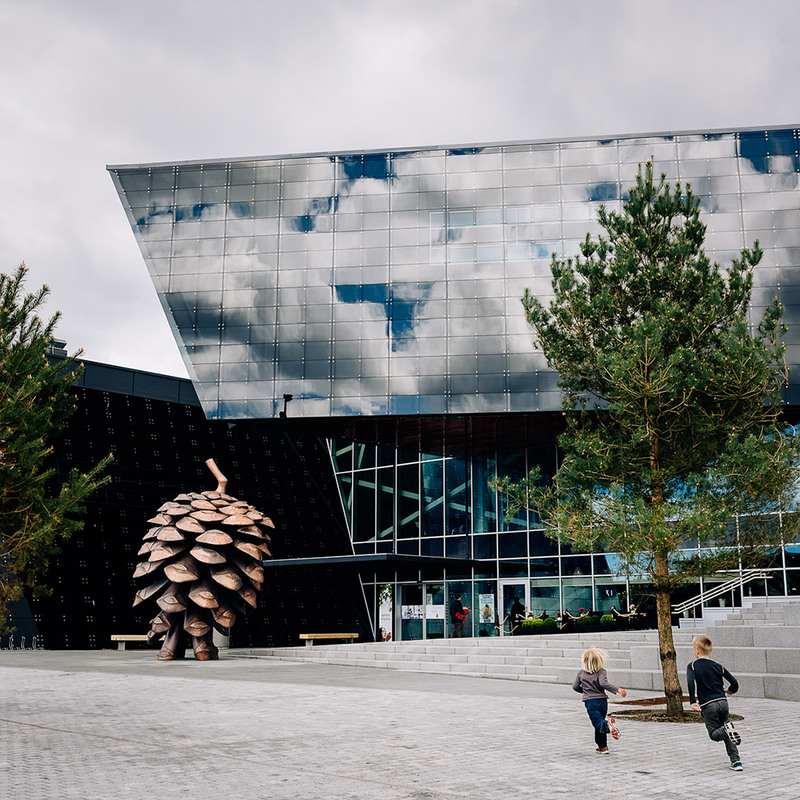 The monument was commissioned by the Norwegian Council for Cultural Affairs, Tyssefallene AS and the Norwegian Department of Culture. 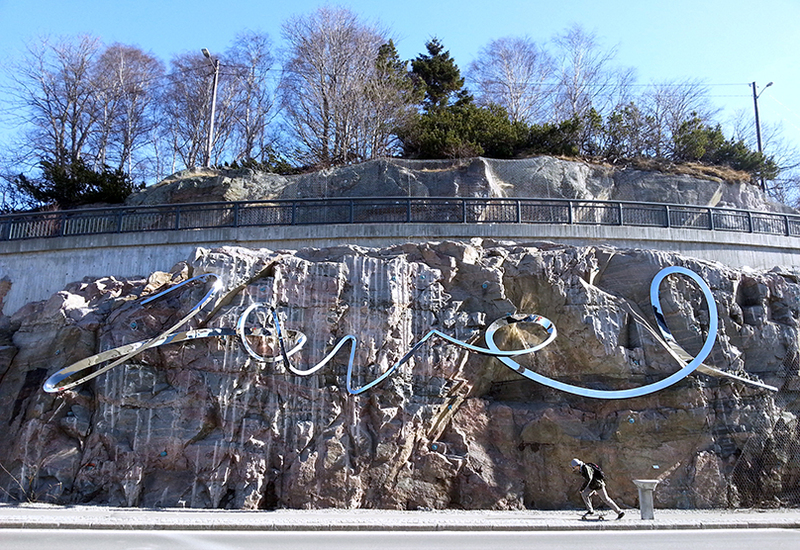 "Javel", the 23 meter large sculpture is strategically situated by the road leading from the city center to the theater Kilden in Kristiansand. It hangs roughly on the hewn cliff at the side of Kilden. The contrast between the materials of the rugged, matt rock face and sculpture's shimmering reflective surface of polished steel is dramatic and beautiful. From a distance the work look like a smooth shiny undulating line. But as one approaches Kilden the abstract sculpture turns into something readable. The serpentine line of steel spells out a word "Javel". It is the ultimate symbol of a wish for a binding bridge between the people and art. Bomuldsfabriken Kunsthall, one of the leading venues for contemporary art in Norway. The exhibition hall presents a wide variety of exhibitions of contemporary artists - putting on 16 major art exhibitions each year. In addition it houses a collection of artwork by 40 well known Norwegian artists. 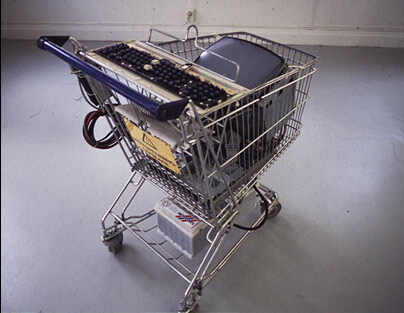 Performance/installation art at Bergen Kunsthall, 1999. An exploration of art/commerce. 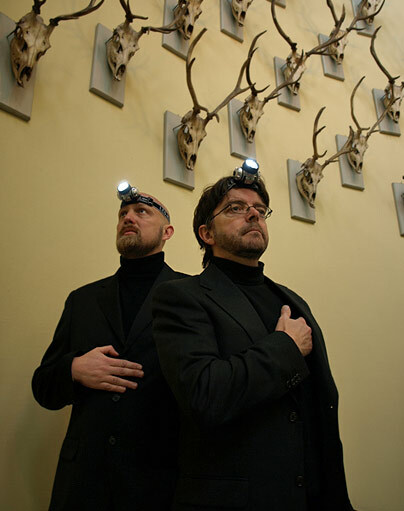 In cooperation with Löplabbet, Geir Karl Karlsen. The artobject shaped as an oversized springboard was made for Halale Carol. The idea was to focus on collaboration between architects, entrepeneurs, artists, the local community and politicians to to develop the industrial plant into something new and a meeting place for people and ideas. The main feature of a springboard is to give an extra boost, while this spring-boards size requires multiple people cooperating to get the board swinging. This is the most obvious parallel to the situation the project is a part of – art and architecture boosting the processes of urban development. 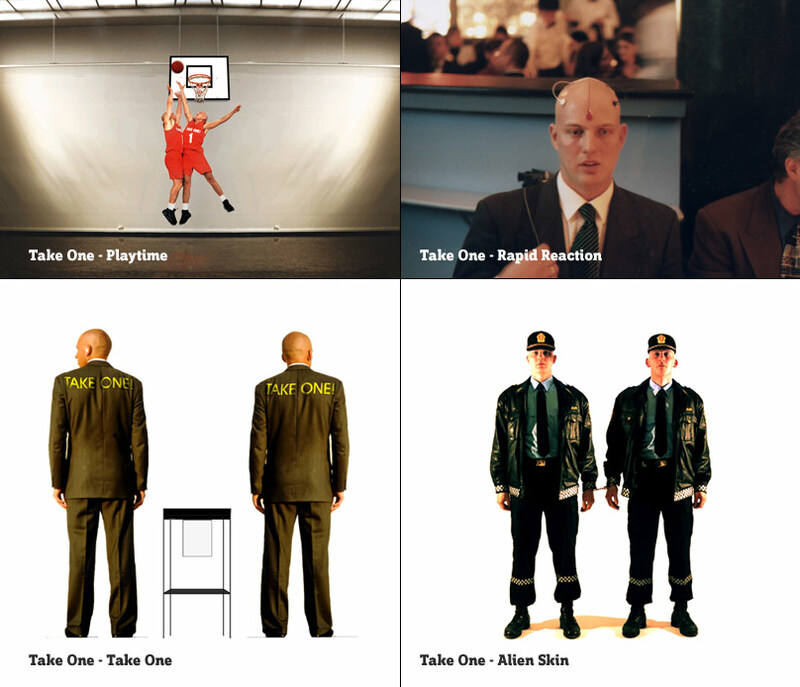 Performance projects in cooperation with Geir Karl Karlsen spanning from 1995 to 2001. Performed at Henie Onstad Art Center, Høstutstillingen - annual national collective art exhibition, and Bergen Kunsthall. Sculpture/Installation. Based on Aristotle's Ars Poetica - with a start, a middle and an end. The start and the end was fixed, everything in the middle was based on fuzzy logic giving out quotations from everyday publications, television, conversations, etc to profound quotations like the view on art by Robert Longo. It could be a travel within the mind of John Cage to the personality disorder of Phineas Cage. 2016 Genesis, unge Olav. 1000 year Jubilee Sculpture in Sarspsborg Norway. Unveiled by His Majesty King Harald. 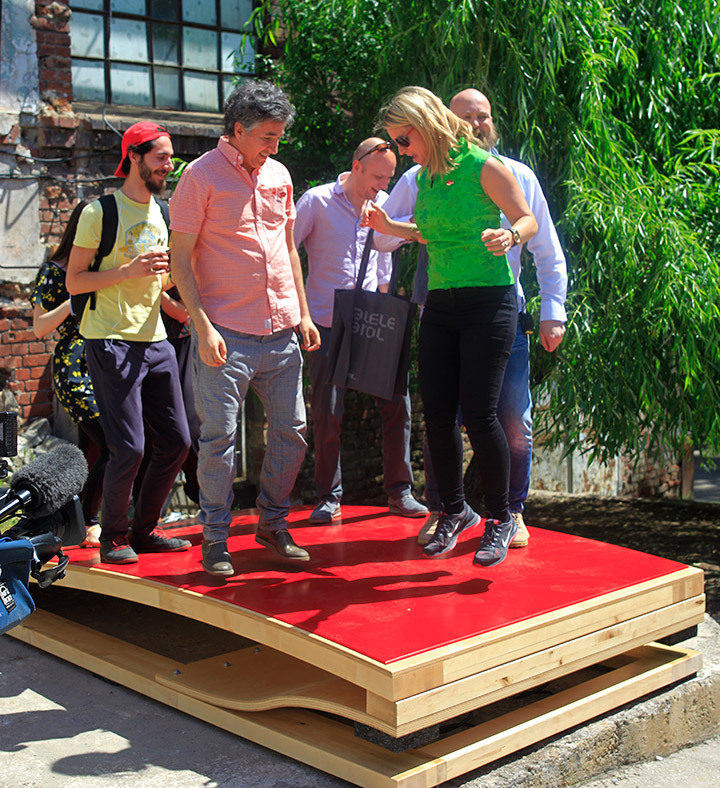 2015 Jump, installation in Bucharest Halele Carol. 2014 Konglo, sculpture object in Sotra based on Rene Descartes theories on the Pinael Gland. 2013 Kodevegg, codesculpture at FSES/FEH. Norwegian Defense Intelligence School (NORDISc). 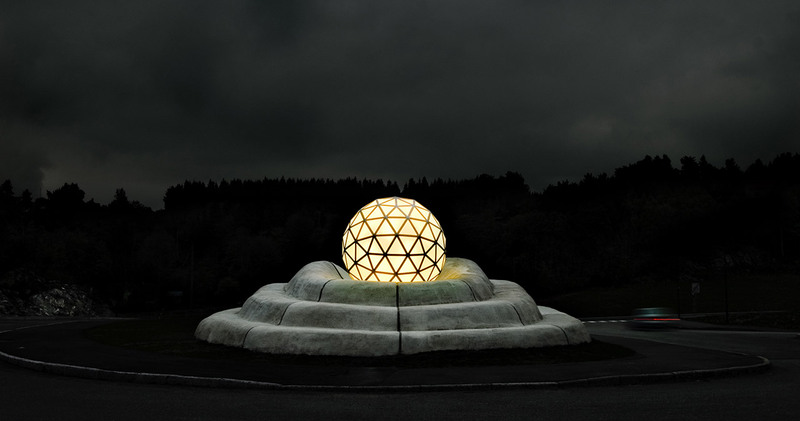 2012 "Ledelys" / "Beacon", five sculptures/installations placed according to Goethes colorcircle. At Bergen/Fana. 2011 Javel, sculpture/installation at Kilden Performing Arts Centre in Kristiansand. Kilden is the home of Agder Regional Theatre, Kristiansand Symphony Orchestra and Opera Sør. 2005 SOL / Pulse sculpture, a futuristic and innovative project where contemporary art and new forms of habitation interact with each other. Sculptor and conceptual leader. 2001-04 Electric Farm. Creative Director. 1999 Norwegian National Monument Elektra. Sculptor. 1995 Cage. Opening exhibition Galleri Otto Plonk. 1995-99 National Academy of Art Bergen, Norway. 1992-94 Art Studies, University of Bergen. 1990 United Nations Forces, Lebanon, Officer. 1989 Theater science, University of Bergen. 1987 Class of Bergen Katedralskole.